These cruise ships are actually a great place to be on port day. Most people go on shore so I feel as if I have this wonderful luxury liner to myself. This day was no different. The self-serve laundry where you usually have to line up for a washing machine, was empty and I was able to get laundry done early and quickly, and then head down two decks to the Queen’s Room to set my laptop up on a table next to the windows and voila- the ideal office. I managed to catch up on all my email, and get a fair amount of writing done. I was gearing up to take the A to Z Blogging Challenge with my AtJillsReviews blog, so I heeded the advice of others who have previously taken the blogging challenge and prepared several segments so they would be ready for posting when the Challenge began on April 1. The theme I chose for the challenge was to focus on brief travel and culinary tidbits from the cruise from Hong Kong to Dubai, with occasional forays into the craziness of human behaviour, including mine. The first link will take you to entry A where I describe the theme for my challenge. The second link will take you to AtJillsReviews where you can read the current post and the preceding ones - in reverse chronological order. Heeding advice that sitting too long is not good for body or soul, I had my dance practice shoes with me, so when I got really tired of sitting still and writing, I took out my IPod and had a great dance workout on the empty Queens Room dance floor. It was like being back in my gym at home where my standard daily aerobic workout consists of high energy dances like chacha, samba, jive, quickstep, interspersed with slower dances like waltz or bolero where I can really work on strength, balance and stretching. 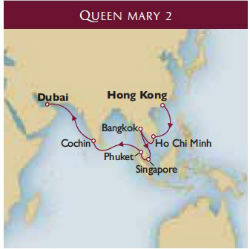 I so enjoyed my port day on board that I opted to do the same when the QM2 called in at Bangkok and Singapore. I have spent a fair amount of time in Bangkok, namely several weeks on various visits in 1996 and 1997 when I was working as a consultant on laboratory services with people from the Thai Ministry of Health. I also spent a few days in Bangkok at the end of my previous SE Asia cruise so at Laem Chabang, and in Singapore, I also opted to stay on board rather than do excursions. The Singapore stop was the day when I moved from my shared cabin with Linda to a single cabin for the last part of the cruise. I did go ashore in Phuket where I wanted to see how the town had recovered from the devastating tsunami of 2004. Cochin in the state of Kerala, India was one port where I definitely planned to go ashore for a couple of reasons. Firstly I had had to get a visa for India or would not have been allowed to board the ship regardless of whether I opted to go ashore in India or not. That visa cost a cool couple of hundred dollars, and because of the timing when my passport was not in my possession, it meant that I had to miss going to California for my grandkids' birthdays. So come hell or high water, I was going to go ashore in India. Luckily there was an excursion that interested me - the leisurely tour of Cochin that culminated at a hotel where we would see a demonstration and introduction to Kathakali, the classical dance drama of Kerala in Southern India. First developed in the 17th century and based on stories from Hindu mythology. The art form blends literature, music, painting, dance and acting and the characters do not speak. Everything is conveyed through physical acting, classical facial and hand movements, while the narrative is sung by a different performer.The stories are full of violence. The segment we saw involved some hero killing a female demon by slicing off her breasts and then flicking away the blood from his sword. Nice! I found the visit to Cochin fascinating. See the post Cochin: From Fishing to Fighting for videos of the famous Chinese Fishing Nets, Kathakali and Kalaripayattu. As we left Phuket en route to Cochin, an announcement by the Captain, and an alert notice, informed us of heightened security measures that were being implemented because we would be sailing through areas where PIRACY was a major problem. For those of us leaving the ship in Dubai, the areas of concern were traversing the Indian Ocean through the Bay of Bengal and then past the Maldives into the Arabian Sea. We then would go through the Gulf of Oman, past the Strait of Hormuz into the Persian Gulf or Arabian Gulf depending on your political leaning. Apparently, where the ship was continuing, through the Gulf of Aden and the Red Sea, also are high security areas. Before the Captain's announcement, a couple of our group had noticed that for several nights there were two crew members stationed on each side of one of the upper decks, each with some kind or equipment - I think it was radar - that would enable them to detect any boats approaching our ship. Then came the announcement by the Captain that a higher level of security would be enforced to counter the risk of piracy. Certain deck areas were closed at night so they could be kept dark and allow lookouts to keep a better watch. We had a special passenger drill about what to do in the event the ship was threatened. It involved us gathering in the corridor outside our cabins and actually turned into quite a pleasant "neighborhood" event, as we met and chatted with people who were in nearby cabins while we waited to be dismissed from the drill. Later we were told that a British Naval Commodore and armed guards would be coming on board to advise the Captain and crew during the high risk transit times. I was surprised that a ship the size of the Queen Mary could be considered at risk as I somehow thought that it was only the small sailing boats and small commercial vessels that these pirates attacked but I learned that in 2005 , the Seabourn Spirit, a top-of-the-line small luxury cruise ship with 115 passengers aboard, was attacked by pirates off the coast of Somalia. They were repelled by sound waves from a Long Range Acoustic Device, but only after they had fired rocket-propelled grenades and machine guns at the ship. Wow. Those passengers must have had quite a story to tell their friends. Fortunately we arrived in Dubai without incident, and sadly had to disembark from this wonderful ocean liner. Can't wait for my next QM2 cruise.